One Stop Service Platform | Business Automation Ltd. 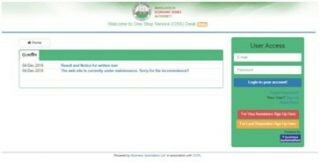 The One Stop Service (OSS) is an online facilitation mechanism that seeks to bring relevant government agencies together, coordinated and streamlined, to provide efficient and transparent services to applicant. Many countries around the world have established similar centres to centralize the execution of a number of regulatory, compliance, and value-added services through a single physical or virtual location. The purpose of an OSS is to provide investors with a single place for applying for and obtaining necessary approvals for different registrations, licenses, and permits required for investment in the country. 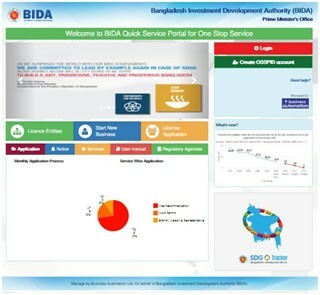 The Government of Bangladesh (GoB) aspires to be a middle-income country by 2021 and, therefore, is determined to continue improving the overall business and investment climate and strengthen the country’s trade competitiveness by ensuring transparency, streamlined cross-government functions, and better access to information. Within this economic and strategic context, and following international best practices in attracting inward foreign direct investment, the GoB has envisioned implementing an OSS for facilitating investor services and promoting investment in the country. A single website comprised of two sub-components. First, an online platform for delivering investor services to registered users. The platform will enable investors to view, request, and receive services and will enable the concerned government agencies to deliver those services. Second, an information portal for presenting all investment news, statistics, reports, primary and secondary laws, guidelines and instructions, and any other investment related information. An internal workflow management system that enables BIDA to process applications in the back office. The workflow management system shall automatically orchestrate electronic service delivery through the concerned participating government agencies as well as the flow of information among them. An internal document management and archiving system. A centralized backend data storage system with data redundancy, which enables BIDA to store and manage all transaction, user, and system data. 5 An internal reporting engine and data discovery and visualization tools.